At the height of the summer travel season when airports are at their busiest, it is a good time to look into those havens from the cacophony of the concourse known as airport lounges and how to access those oases without breaking the bank. Most commonly associated with a specific airline, these oases come at a cost but there are several ways to make the price of admission downright affordable. As well, there are more and more options to the so-called "legacy" lounges operated by the airlines. 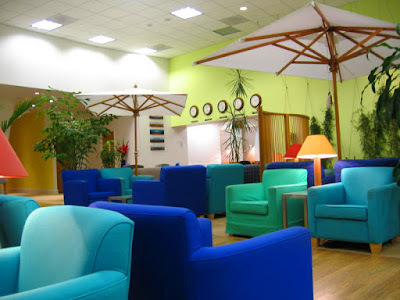 During my travels, I have visited Alaska Airlines Board Rooms, United Clubs, the now-defunct United Red Carpet and U.S. Airways Clubs, American Airlines Admirals Clubs, an Iberia Airways Lounge, British Airways Speedwing and Terrace Lounges, Lufthansa's Business Class lounge and Virgin America's Loft, to name but a few. 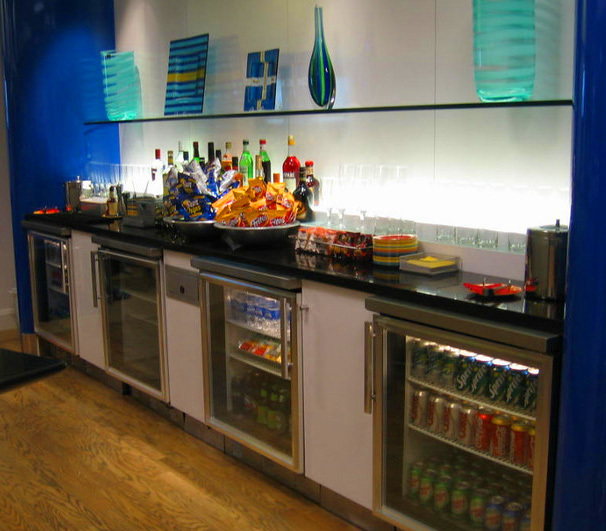 Most clubs, like the British Airways club depicted here, offer numerous complimentary features including Wi-Fi; beer, wine, spirits, soft drinks, and snacks; newspapers; business centers; meeting rooms; and showers. The list goes on and, of course, varies by club and location. recently, I published a post comparing several of the clubs and their offerings. I have purchased short-term passes to such clubs when circumstances made the fee a better option than spending time among the teeming masses in the main terminal. But such passes have their drawbacks and vary significantly from one airline to another. While some airline clubs offer "day passes," they are only good for the day of issue as the name implies. You may gain access to multiple clubs if you have connecting flights and layovers but the benefits expire at midnight, usually local time, so day passes may not be beneficial if your travels span more than one date – if you’re taking a red-eye, for example. While it used to be that the first person would pay $50 for a day pass and a second person might be able to gain admission for additional $25, those days appear to be gone. Now, the most common arrangement is a fixed price per person, no matter how many are in your party. Further, airlines differ from each other. United Airlines (NYSE:UAL) United Clubs and Delta Air Lines (NYSE:DAL) Sky Clubs do not offer day passes but "one-time" or "single-visit" passes good for one visit to one club for one person at a cost of $59. Travelers with a connection will need to buy a second pass at their transfer airport if they want to access another club. Other airlines may offer 24-hour passes which can be much more beneficial if crossing several time zones, particularly when flying in an easterly direction. Such passes are good for 24 hours from the time of issue and that time is coordinated across the time zones by the carrier, so travelers have a full 24 hours to use their passes. I have held annual memberships to American Airlines (NYSE:AAL) Admirals Clubs and United Clubs but annual memberships can cost as much as $550, and sometimes add an initiation fee for the first year's membership. But there are other ways to obtain an annual membership that allows virtually unlimited access at about half that cost and, increasingly, other options to the so-called "legacy clubs" operated by specific carriers. While legacy clubs remain popular and are still the most common form of "VIP lounges," one needn't buy an annual membership using cash or accrued frequent flier miles to access them. Banks have been offering airline affinity cards for years – cards that earn miles for every dollar spent. More recently, many have begun offering cards that combine the mileage benefit and club membership. It is this bundling of features that makes membership more affordable. As an example, consider the United Airlines VISA® card. Issued by Chase Bank (NYSE:JPM), the MileagePlus Select VISA® provides miles for every dollar spent and carries an annual fee of $95. 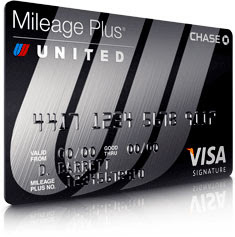 Chase also offers a United Airlines VISA® Club Card that also provides miles for every dollar spent and membership in United Airlines’ United Club. The annual fee for the Club Card is $450, lowering the net cost of club membership to $355, or a little less than $30 a month when compared to the MileagePlus Select VISA®. Both cards offer up to two free checked bags per trip, or "Up to $240 per round trip," according to the Chase webpage detailing card benefits. As an additional value-add, both cards waive foreign transaction fees, which are typically three percent of the amount spent or withdrawn from an ATM (not including ATM fees). Compare the annual fee to the cost of day or one-time passes. If a traveler buys one-time passes for two people on both the outbound and inbound legs of their trip, those passes would cost $236. If a traveler takes as few as two trips per year with a companion (or three trips alone, where days passes both ways would cost $118 per trip), the annual credit card fee and associated membership becomes a bargain by comparison. And the more one travels, the cheaper membership becomes. If you travel outside the U.S., such a card will save you about US$30 for every US$1,000 you spend beyond our borders, lowering the net cost even further. Unless you’re a truly infrequent traveler, it is definitely something worth considering. Those who are truly infrequent fliers may want to consider affinity cards like the MileagePlus Select VISA® that offer miles per dollar spent and two club passes per year. With its considerably lower annual fee of $95, once- or twice-a-year club access maybe enough for casual travelers. The increasing range of other options available today includes a pass that does not restrict travelers to lounges operated by a specific airline. Priority Pass has entered into arrangements with a number of airlines that allow its members access to more than 850 airline clubs worldwide. Annual rates are on par with individual airline club memberships, but the flexibility it offers leaves individual airline clubs standing at the gate. More details on Priority Pass in tomorrow's post. Credit card issuer American Express has opened a handful of airport lounges under the name Centurion Lounges for cardholders of a certain level, providing yet another option for a quiet retreat while traveling. Centurion Lounges are currently open in seven airports including Seattle-Tacoma International Airport (SEA), San Francisco International (SFO), Las Vegas McCarran International (LAS), Dallas-Ft. Worth International (DFW), George Bush Intercontinental Airport in Houston (IAH), Miami International (MIA) and New York La Guardia (LGA). Lounges are coming soon to Hong Kong International (HKG) and Philadelphia International Airport (PHL). In addition, public lounges are showing up at more airports around the world. Travelers pay a fee for comfortable chairs, snacks, Wi-Fi access, small meals and non-alcoholic beverages. For example, the Airspace Lounge offers access for $20 per day, but only operates three locations: Cleveland (CLE), JFK and San Diego International Airport (SAN). For $35, travelers can buy a day pass to The Club, which offers free snacks and drinks (both alcoholic and non-alcoholic), newspapers and magazines, televisions, telephone, Wi-Fi access and work stations at nine clubs located in eight U.S. airport. Clubs currently open include two each at SEA and LAS, and one club each at Atlanta Hartsfield International Airport (ATL), DFW, Mineta San Jose Airport (SJC), Cincinnati-Northern Kentucky Airport (CVG), Phoenix Sky Harbor International (PHX) and Orlando International Airport (MCO). Unlike most of the clubs operated by individual airlines, guests at many of these public lounges are allowed to bring food purchased from vendors in the concourse. Airport lounges, including The United Club at which I once worked, often prohibit outside food under the rather flimsy rationale that, "The aromas might offend other guests." Personally, I would rather deal with the scent of a food that might not be my favorite that deal with the noise and craziness of the terminal as I sought out lunch or dinner. International travelers will find Plaza Premium Lounges in a number of airports across Hong Kong and China, Australia, Cambodia, Canada, India, Malaysia, the Maldives, Oman, Singapore, Taipei, the Philippines, the U.A.E. and the United Kingdom. These lounges offers a range of à la carte services ranging from admission only to buffet meals, drinks, showers and massage and spa services. The range of services and rather vary by location. Finally, Premium Class passengers travelling internationally may also find that lounge access is among the perks of spending additional dollars or miles. U.A.E.-headquartered Emirates has exclusive premium class lounges available at many of its gateway airports, including Los Angeles International (LAX) and its home airport of Dubai International (DXB) in Dubai. Whatever your preference or wherever you may be traveling, a little homework can pay great dividends in terms of making your travels just that much more pleasant. Editors note: While prices and locations were current as of publication, prices can change and clubs may be opened or closed with or without notice.